First off, this tutorial is meant for people who have been around JED a little while, but still aren't very confident in their level-making abilities. This tutorial focuses on cleaving, so if you are already proficient in this area, you might want to consider moving on to something different, like cogging or 3dos. If, however, you feel your architecture skills leave some more to be desired, this tutorial offers easy ways to dramatically improve the quality and appearance of your level. So let's begin. 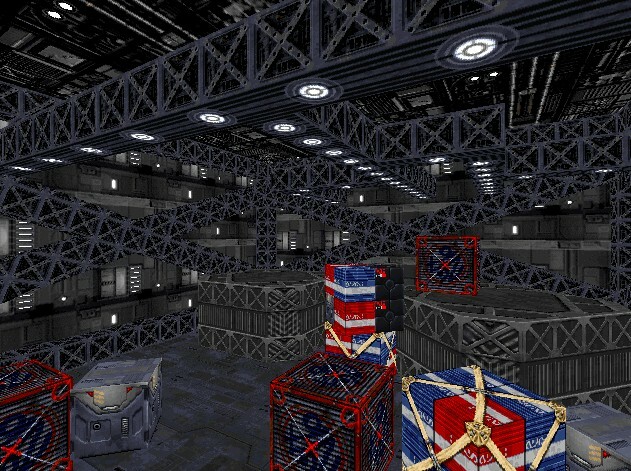 I have seen many new levels lately (both multiplayer and singleplayer) which, while having great potential, are sometimes ruined by boxy, uninteresting sectors. Now obviously some rooms have to be rectangular, like most rooms in your house probably are, but chances are your level does not revolve around your house, but instead some far-off intergalactic locale! If you've ever seen a Star Wars movie (I wonder what the chances of that are? :-) you'll probably notice that each room is as intricate and unique as the next. In a shady cantina, you notice cracks and chunks missing from the decrepit walls, arches and small nooks and crannies where just about anyone or anything hangs out. In the Temple on Yavin you'll observe towering pillars and elaborate domes. Even on a Spartan Star Destroyer, if you look closely, you can appreciate the detail presented in the sloped wall edges and numerous consoles and and buttons protruding from the walls. All of this gives each scene a fresh, and appealing look. Your levels should be no different. I'll begin with a Hangar Bay. So open up JED, and we'll begin. You see the default sector of course, and for the purpose of this tutorial, we're going to enlarge its x axis by 1.5 and its y and z axis by two (be sure of course to un-check the box that says "ignore axis setting, scale on all"). Now in "shift-1" view, cleave the sector vertically into thirds. Your sectors should now look like this. After that, go to "shift-2" view and cleave until your level now looks likes this. Go back to "shift-1" and systematically cleave the new "corner" sectors until they appear as so. Finally, just delete every other corner sector, making sure the top and bottom are consistent. 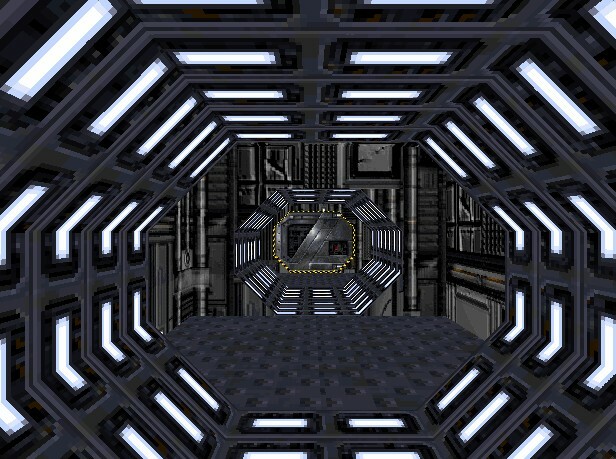 To spruce the appearance up a bit, I've textured the level, and now let's see just how much it really looks like a hangar bay. Looks pretty good to me. See what a difference that cleaving makes! Now I'm going to show you a few variations on different corridor designs you can do. So, start a new project in JED. For the first variation, I'll do something really simple, similar to the hangar bay. Resize the default sector, by cleaving it to 6 JKUs in width (x) and 4 in height (z). Leave length (y) alone. Press F4 and select "Snap every 0.05" for your cleaving. Now go to "Shift-2" view and cleave until the corridor looks like the pic below. To get the two little sectors coming off at the sides, simply extrude the side surfaces by 0.05. 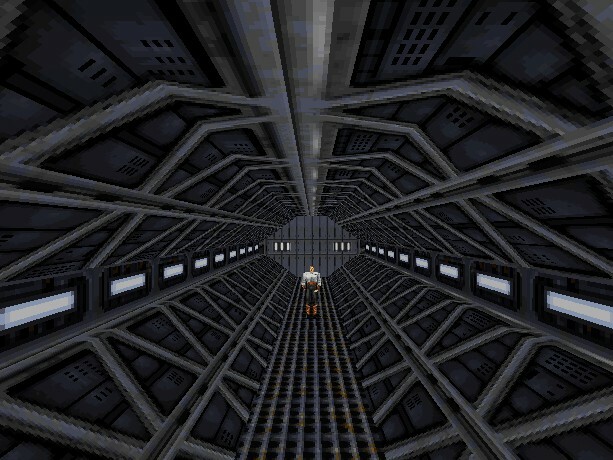 And here's a picture of the textured corridor. On to another corridor variant. Again, start a new JED project. Make a corridor according to the parameters for the previous hallway. This time, we're going to make "arches" every 4 jkus. Divide up the sector like so. Next, select "Snap every 0.02" and cleave out the top rectangle to form a doorway. Cleave a smaller sector for the door out of the rectangle, and cleave the corners off the two rectangles on either side of the new doorframe. And now for the "arches." Change your cleave size again, and select "Snap every 0.05," and cleave the corners off the third and the fifth box down. Slap on a few textures and Voila! These simple cleaves don't take long, and they add a lot of character to levels. Never settle for a sub-par room. Think up your own methods for expanding and improving it further! For the last time in this tutorial, start a new project. Enlarge the default sector by two, for all three axis at once. Cleave around all the edges of the sector as shown in the picture. Now cleave out new, long sectors that run along the edges of these outer sectors. Then cleave an "X" shape into the sector left in the middle of them. Once done, delete the "X" and the long sectors that it connects to like a frame. 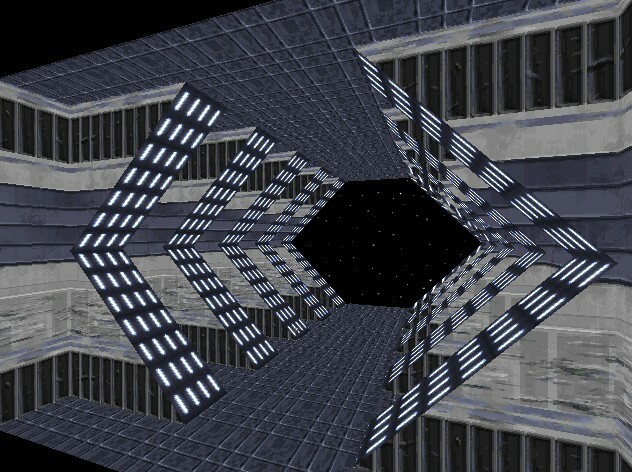 If you want, you can add some ventilation shafts in the upper regions of the central sector, which would give a more convincing look to an old space freighter. See the picture for ideas on how to do so. Well, thanks for taking the time to read this tutorial. Hopefully it helped you slightly. Don't forget that ramps, staircases, and spiral staircases are, of course, also welcome additions to any level. If in doubt try creating some domes and/or beams in your levels. Consult the tutorial by SavageX for an excellent method for confronting domes, one that makes it both easy and painless.